It’s awesome to be on the receiving end of doggy kisses, but it’s a problem when your dog has bad breath. You’ll need some dog bad breath remedies to deal with your dog’s little breath problem, stat. But there are things that you should understand about doggy halitosis in order to effectively remedy it. One of the basic things that we should know is that it’s not just poor dental hygiene that has something to do with it. If your dog has bad breath, there is also a chance that there is a problem in their lungs, gastrointestinal tract, or even in their internal organs. The stink comes from odor-causing bacteria that has built up in your dog’s body. Then you get hit hard when your dog decides to pant in your face. Or it contributes to that nasty dog smell around your house from constant licking. Whatever dog bad breath remedies you choose to use should rely on the main reason why your dog has halitosis. Most commonly, bad breath in dogs is caused by plaque and tartar build up in your dog’s teeth or gums. These dental and gum diseases are most common in small dogs (like Chihuahuas) because of their skull structure. There are smaller spaces between their teeth which makes it easier for food to get stuck in. Which in turn can cause tartar and plaque build up. Sometimes, dental and/or gum disease is pretty easy to diagnose. The plaque and tartar are pretty obvious to see on their teeth. Inn more advanced cases the bacteria can even leave dark stains on their teeth and gums. If you take care of your dog’s dental health, then their persistent halitosis may be caused by more serious health concerns. As mentioned above, it can also be caused by bacteria in your dog’s internal organs. Given that there are different reasons for doggy bad breath, a trip to the vet is in order. A veterinarian is the best equipped person to tell you what is causing your dog’s bad breath. Added with the symptom of your dog drinking and peeing more than normal, it could be a sign of diabetes. That may sound nasty, but it’s not just your dog licking themselves clean after peeing. Breath that smells like pee can indicate a kidney problem. Along with vomiting and a lack of appetite, as well as yellow tinged corneas or gums. These are signs that your dog is suffering from a liver problem. Once your vet has diagnosed the root of the problem (heh, root), you can now proceed with dog bad breath remedies. Most of these remedies work for the dental and gum diseases but more serious health problems will probably require medications provided by your vet. For dental and gum diseases, it can be remedied with some antibiotics and better dental hygiene. If you haven’t been brushing your dog’s teeth before, then you should start now. As we said, bad breath is never a good sign of anything. If the bacteria came from poor dental hygiene, then dealing with that is the answer. Luckily, toothpastes formulated for dogs can also remove the plaque and tartar build-up on your dog’s teeth and gums. Brushing your dog’s teeth regularly will get rid of what’s already there and prevent any new ones from forming. Smaller dogs are prone to this, so daily brushing is necessary. Larger dogs can go longer without brushing, but it’s still good to brush their teeth every now and then. Giving your dog something to chew on will also keep their teeth clean. Raw bones (not cooked!) are great for this task. With enough raw bones to chew on, your dog’s teeth will be polished up in no time. Of course, continue with the brushing still. If you have no access to raw bones or don’t trust how well your dog’s stomach could take it, dental chews are still an option. These commercial dental chews include ingredients like cinnamon, clove, and chlorophyll to keep your dog’s breath fresh. Your dog’s poop will end up a bit on the greenish side, but that’s just the chlorophyll at work. You’ve heard of all the health benefits of coconut oil, but did you know those properties can carry over to your beloved pooch? As a matter of fact, it’s a great bad breath fighter for dogs. This cure-all has got your dog (and you) covered for a lot of health needs. Simply include coconut oil in your dog’s food and/or brush your dog’s teeth with it. The good news is that dogs love the taste so it wouldn’t be a hassle getting your dog to open their mouth for the much needed coconut oil treatment. The beta-carotene found in carrots is an antioxidant that will help get rid of your dog’s bad breath. Plus, the texture of raw carrots is also great for polishing your dog’s teeth and reaching those inner crevices that are harder to reach with a toothbrush. From my experience with my own dogs, they love the taste too, so it’s a good addition to your dog’s diet. These herbs aren’t just for adding taste to your cooking, but the chlorophyll in them also acts well against your dog’s halitosis. While they may not like the taste, you can add chopped fresh ones to their food or fresh water. Or you can boil them and turn that into a mouthwash for your dog. Lastly, probiotics are helpful for getting rid of bad bacteria and foster the good kind in your dog’s body. Similar to how it works for us humans, probiotics support good bacteria and can treat the bad bacteria in your dog’s digestive system. If home remedies aren’t working, then you may want to consider commercial dental health products for your dog. For instance, a dog dental gel that woks great for dogs who don’t like the old toothbrush and toothpaste method. You can also get this dental starter kit composed of a gel and brush to get rid of the plaque build up on your dog’s teeth. 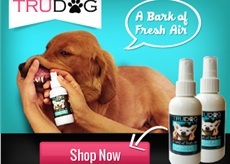 Or you can try out this dental spray to improve your dog’s breath greatly. Within 3-8 weeks, you will see(and smell) the difference. Doggy kisses will be welcome again! Once you know the reason behind your dog’s halitosis, you can use the right dog bad breath remedies best fit for it. on’t forget to consult a veterinarian for the initial diagnosis as well as for follow up check ups to see how your dog is doing. If your dog needs antibiotics for more serious cases, your vet will prescribe that too.